I just got back from Hotlead (2018), in Stratford, Ontario, Canada, and had a fantastic time!!! 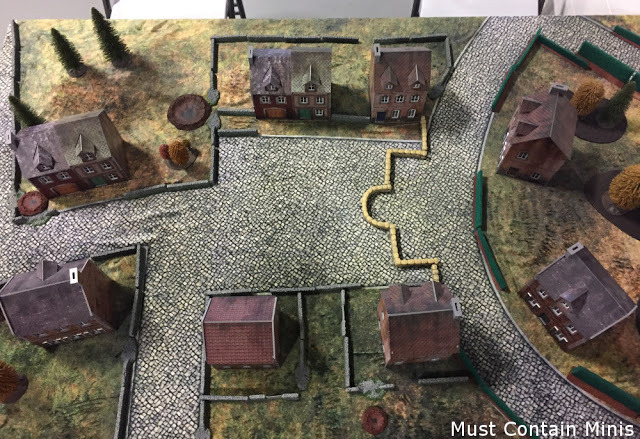 One of the best things about Hotlead is that they run tons of participation games where you can try out different rule sets without owning the books or models. The hosts provide everything for you and teach you how to play new games. 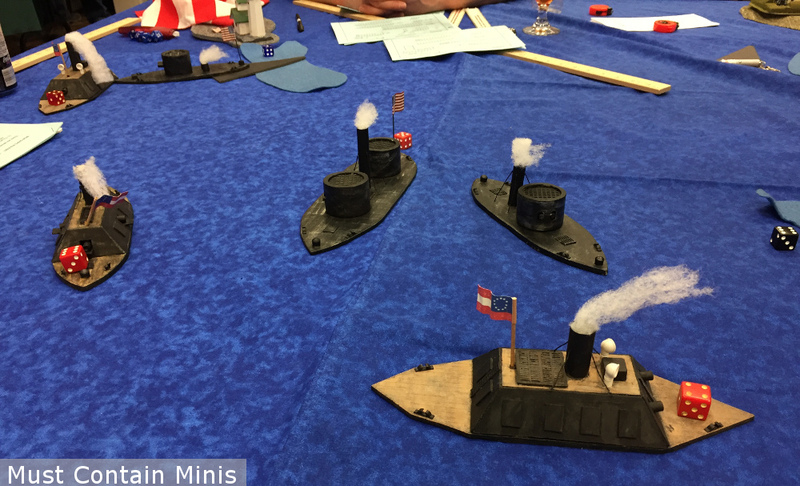 In this post, I quickly discuss a home-brew game called Iron Ships (a 15mm naval miniatures game set in the American Civil War Period, ran by Mike Barratt). 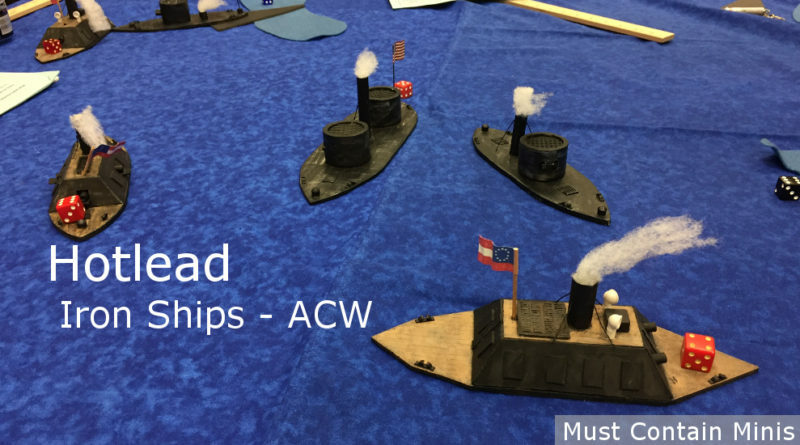 I did not know much about ACW ships before the game. I knew Ironclad ships existed, but I didn’t know much about their look or how they operated. Our host provided us with the context of history for these ships and gave each side three ships to work with. I was very surprised at the low-profile of the Union Ships. This is one of the Union ships. I was very surprised at how little of the hull shows on the surface of the water and that it had a turret. Likewise, I was not sure what to expect from the Confederate ships. They are of an older design and technology than the Union ships, but they have a lot of Cannons to fire if you manage to broadside a ship. These are the Confederate ships. They have lots of cannon hatches along the sides and one or two across the front and back of the ships. One neat fact from this game is that the front and rear cannons are actually maneuvered to fire out the side ports when necessary and then re-positioned to fire out the front (or back) when needed. 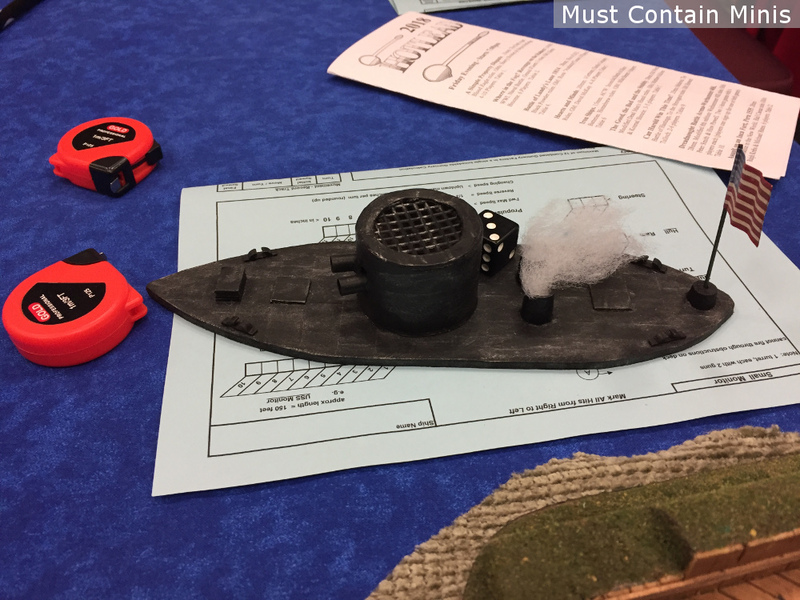 In this game, the Confederates have older style ships that relied on broadside tactics while the Union had faster and better ships with turrets (but fewer guns overall). 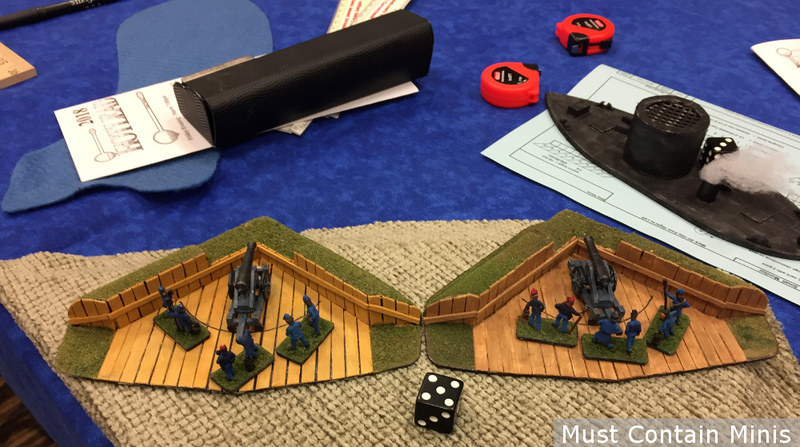 The Scenario we played for this was a fictional battle that may or may not have happened. It was not based off of a single battle, but instead off of a possible encounter that may have happened. In it, the South controls a river system while the North controls the sea (and enters the game through the sea). The battle itself takes place on the river during high-tide. On top of three ships, each side was given a battery of two shore based cannons to aid in the fight. Both sides were also given a battery of two cannons. The objective was simple – destroy your enemy. 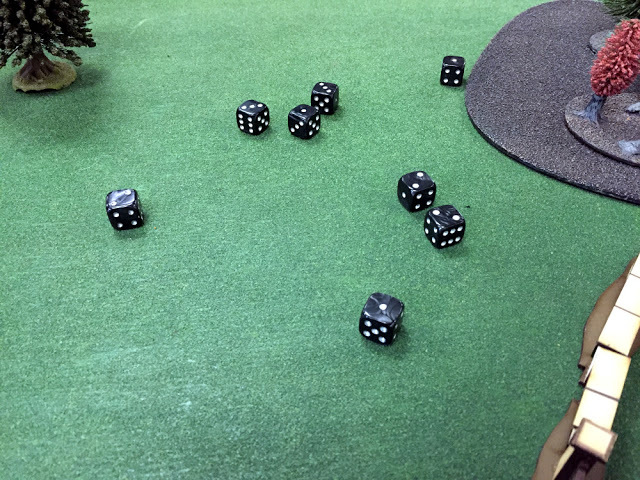 Below is a picture of the game in play. The South entered on the left through the river systems and the North entered on the right from the sea. 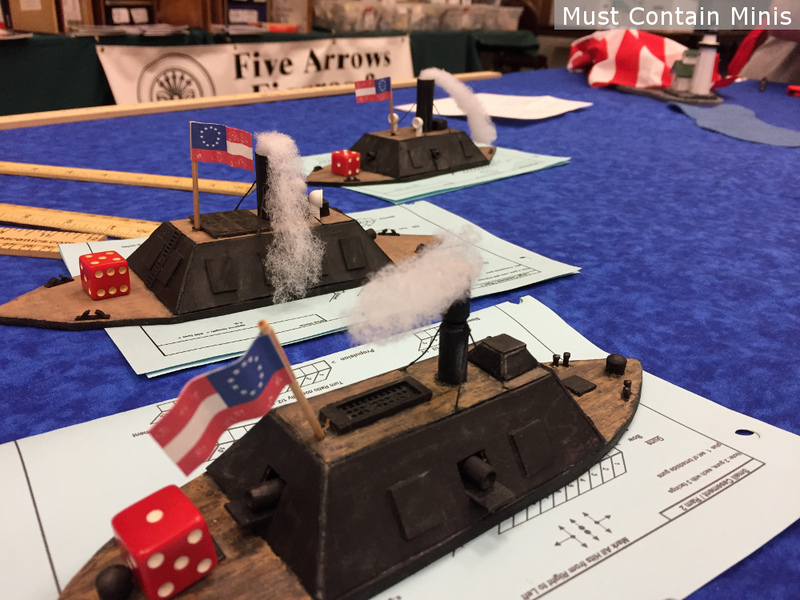 The Confederates decided to bring on all three of their ships at once while the Union went with a more cautious line approach with one ship entering per turn. The system was fast and fun. By the end of turn three, we (the participants) were pretty much running the game on our own. 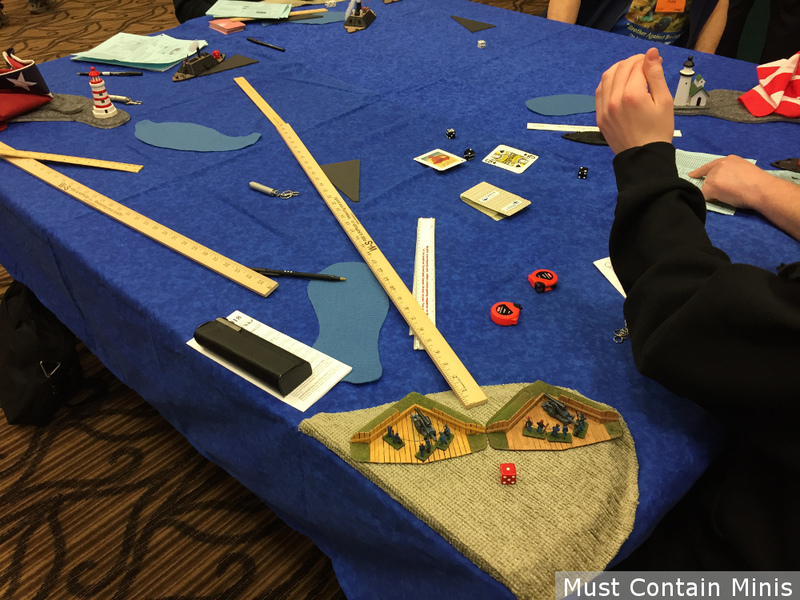 In fact, our gaming host had to run out of the convention for a short duration and we were able to continue the game without him there. 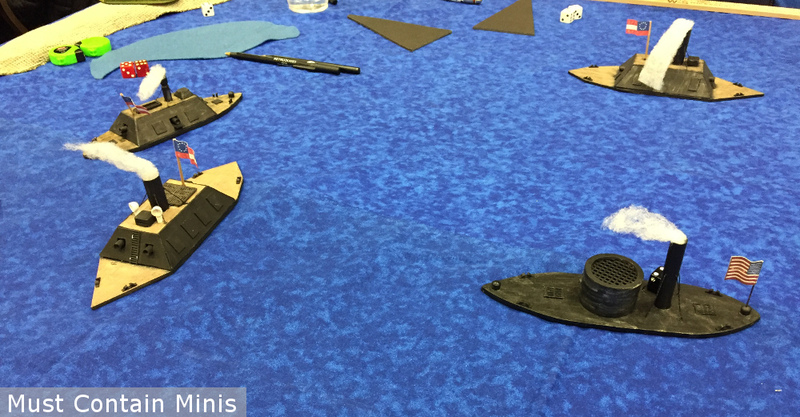 The game uses D6s for initiative rolls and there are separate initiatives rolled for each ship during each phase (movement and firing). Shooting is determined by adding up your firing factors (Combined Cannon Power of the firing ship in question) and comparing that number to a chart. That chart tells you how many cards you can flip over from a fresh deck of ordinary playing cards. Each face card represents a hit and the suit determines the hit location. The hit location determines what systems (or ship elements) are damaged and the effect of the hit. As you take damage, you check damage off of a “ship card” like you would for BattleTech. Once you run out of Crew or Float-Ability, your ship is done. These rules were slick and quick, which is great for a convention game. I enjoyed the game and think that Mike did a good job with developing this system. That said, I could see the card-flip mechanic for damage really slowing the game down if you scale this game up with more ships. 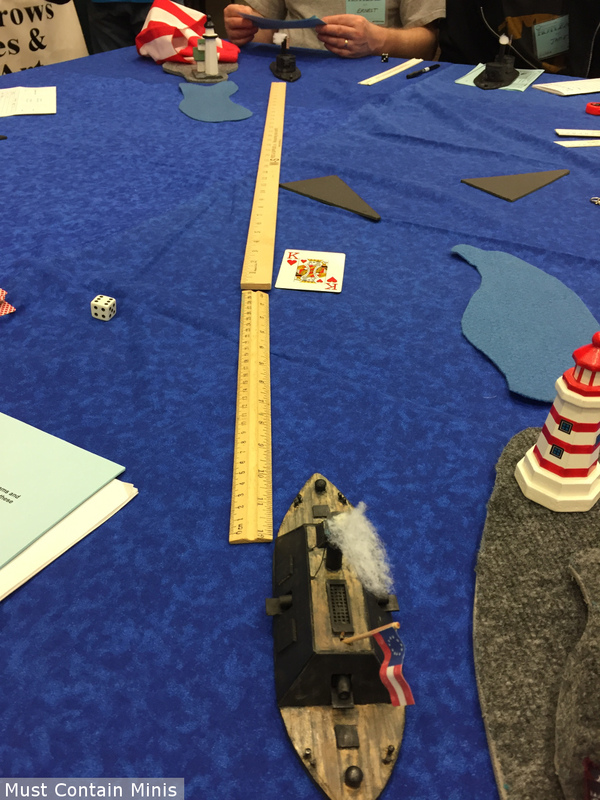 In some cases, we were flipping over 10 to 20 cards to determine damage on a ship. There might have been instances where you could even flip more than 30 cards over to resolve your attack. Taking a ship completely out of action is difficult, but possible. Disabling a ship to the point that a player would like to withdraw it from combat is less difficult. Below is my quick account of how the game went. The Confederate ship closest to the camera was mine for this game. Right off the start, I took a shot at a Union ship with my bow Cannon. The shot hits and causes a little damage to the Union ship. I definitely have the Union players’ attention. 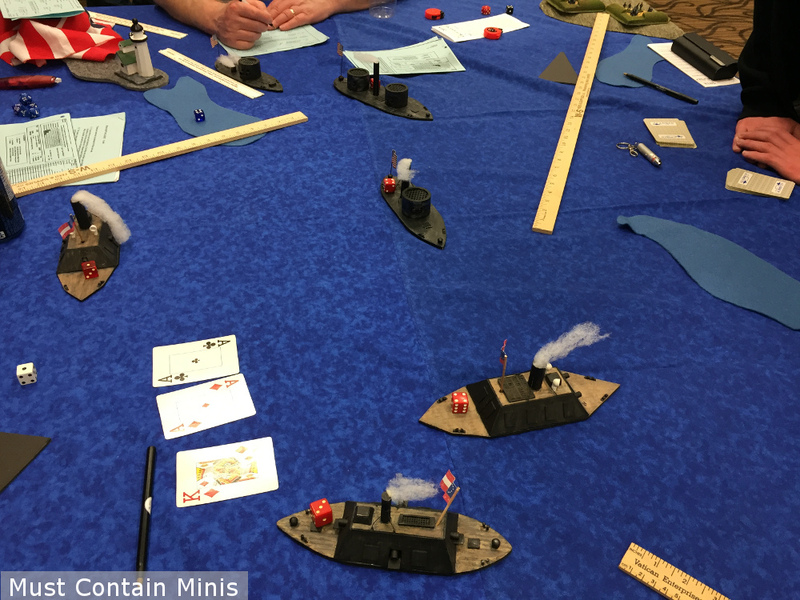 The Union Shore Cannons fire back at my ship and damage its propulsion system. My ship now travels slower across the board (which is too bad because I was running the fastest and most maneuverable Confederate ship). The Union Ship moves toward the Confederate lines and takes a beating. Notice, all three of our Confederate ships are broadsiding that poor Union ship. In the end, all of this ship’s crew is killed off by Cannon fire. While the front Union Ship is taking a beating, there are two fresh ships behind it. The front Union ship is now taken out, but the other two are fairly fresh while all three of the Confederate Ships have suffered significant damage. At this time, the tide starts reducing back to the sea. Notice that the Union ship on the top left is making a move to ram a Confederate ship. The hit on the rammed ship is not as devastating as expected, but still bad. The Union Player should have taken a longer and faster run at the ship to cause more damage. 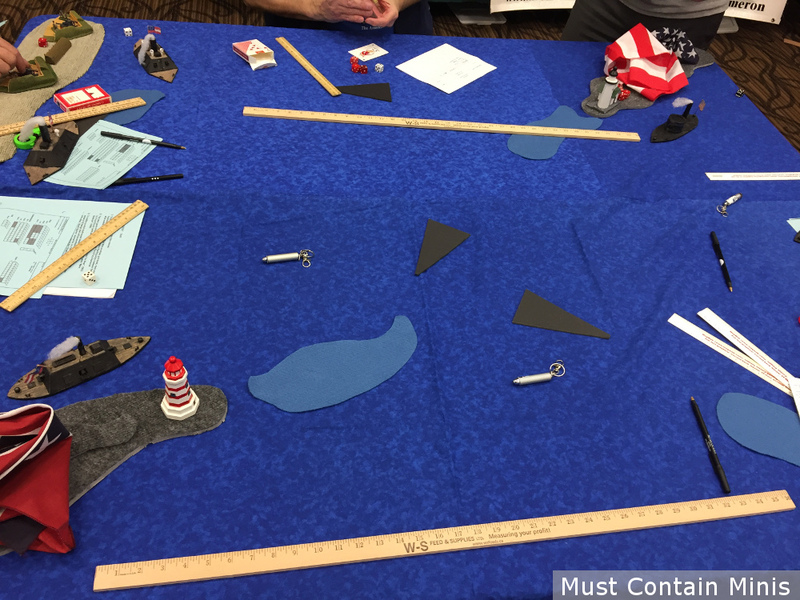 At this point, the tides change and both generals decide to turn their ships home. The Confederate ships have suffered a lot of structural damage, but the Union ships lost a lot of crew. There was no clearly defined winner. Overall, I had a lot of fun with this game. It was simple, fun and fast, plus I learned some tidbits about an era of history that is not my forte. 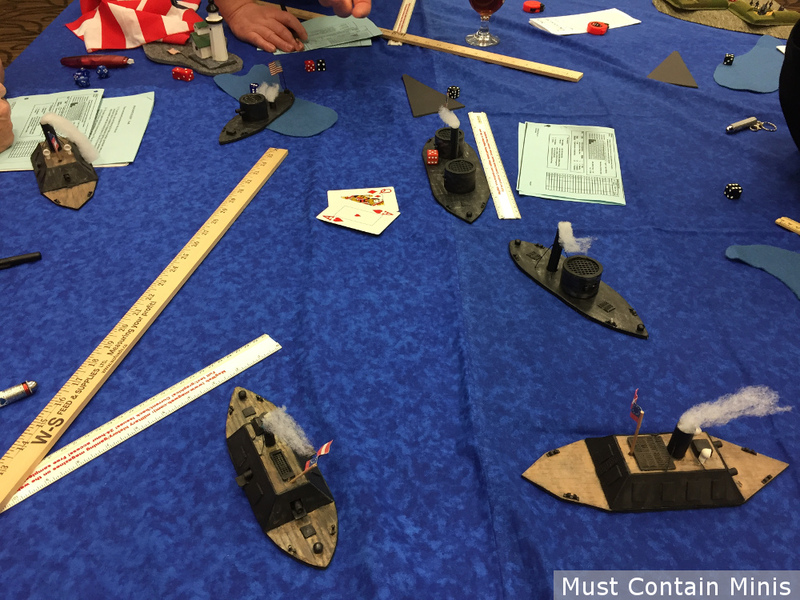 Thanks goes out to Mike for hosting this game and for teaching us his rules for American Civil War Naval Combat. I would also like to thank the organizers of Hotlead for putting on a fantastic gaming event. 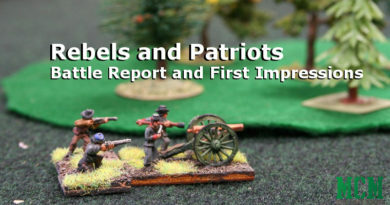 As I discussed with St. Andrews Wargaming, it was Hotlead that drew me back into miniature wargaming and the event continues to deliver loads of fun. A game like this one is not one that I would normally come across at my local stores or gaming clubs, yet I can go to this gaming convention and try out all sorts of great games without even owning the materials myself. That is one of the things that I love about gaming conventions of this style and I am happy that such a large event is near where I live.